You can make team members “Task Watchers”. This means they can see a task’s progress. They get copied on any comments and notifications about the task. Please note: Being a Task Watcher only means the member can see the task and is notified of any changes to it. In order to edit the task, they need to have at least ‘Adjust’ project access permissions (read more) or a higher permission level. 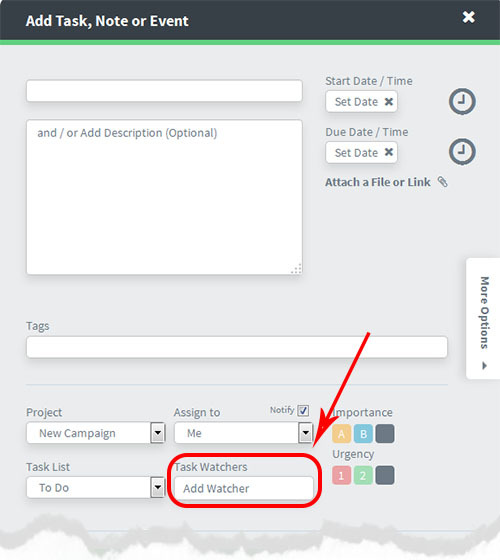 With one click you can set a Team Member to automatically watch EVERY task in a project. This means you don’t have to add, for example a client, to every task by hand. To do this open the “Your Team” screen in the required project. Then use the checkbox “Watch Only” as required. have at least ‘Adjust’ or higher – permission level.